Having established himself at Super 14 level with the ACT Brumbies, Ma'afu was selected to tour with the Wallabies in the 2009 spring squad. 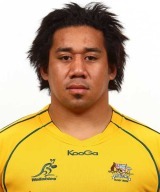 Ma'afu had already represented Australia A at Pacific Nations Cups and had also turned out for the Barbarians. The powerful front rower, who has Tongan and Fijian heritage, switched from rugby league to union as a youngster before climbing through the Sydney and NSW juniors ranks to make his Super Rugby debut in 2007. In 2010 he won his Test debut at tight-head against Fiji, facing off against his brother, Campese. He retained his place for Tests against England and Ireland in the absence of Benn Robinson and Ben Alexander but was yellow-carded as part of an inexperienced front-row that shipped two penalty tries against the English in the first Test at Subiaco Oval. Despite not registering an appearance for the Wallabies during the 2010-11 season, Ma'afu will go to the World Cup having been named in their 30-man squad.